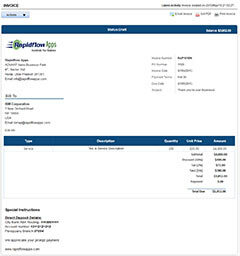 Account receivable delay or leakage is a common for a large percentage of small and large businesses and controlling it requires a flexible and powerful system to help streamline invoice generation, receive payments, monitor the payment delays, generate automated notifications, view of receivable status via dashboards and reports. AccountSight provides you all these features and more to increase your cash flow! Let’s review the account receivable cycle from invoice generation to receipts and what the users can expect from AccountSight's time and billing software. Whether you are a freelance professional or large corporation in need of easy online invoicing software, AccountSight has it all what you need! AccountSight is the most user-friendly and feature-rich cloud-based system to manage your invoicing online with the beautiful invoices that can be personalized to your company’s look and feel. Businesses absolutely love the experience & ease of recurring or non-recurring invoice creation. AccountSight makes invoice management easy and signing up even easier. So take control of your time and billing and improve your cash flow by effectively managing your account receivables using AccountSight. Click here to try it free now! AccountSight is a fast and easy online time tracking, expense tracking and invoicing software. It is a highly useful cloud based application for small businesses, consultants and freelancers for maintaining online timesheets and billing online as well as for mid-size companies that require online projects management, employee timesheet & expense tracking and billing capabilities. The rich functionality and hassle free user experience makes AccountSight unique.